Electric potential is not only at point a but also at all points in the electric field. Point a is used as an example. As will be explained later, the electrical potential does not depend on the charge q. The electric potential energy and electric charge are scalar quantities so that the electric potential also includes scalar quantities. The international system unit of the electric potential energy is Joule and the international system unit of electrical charge is Coulomb so that the international system unit of electrical potential is Joule per Coulomb (J/C). Another name for J/C is the Volt, derived from the name of the Italian scientist and inventor of the electric battery, Alessandro Volta (1745-1827). Vab is an electric potential difference between two points in an electric field, for example points a and b. The difference in electric potential between points a and b (Vab) is the same as the work done by the electric force in the electric charge when moving from point a to point b, per unit charge (Wab / q). It should be noted that the work done by the electric force at the charge q when moving from point a to point b (Wab) is equal to the change in the electric potential energy of charge q (ΔEP). 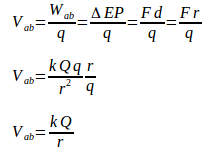 Therefore in the equation above ΔEP can be replaced with Wab. When an object is at a certain height above the ground surface, it has gravitational potential energy, where the ground surface is used as a reference point. In this case, the height of the ground surface and the gravitational potential energy right at the ground surface is set to zero. Similar to the gravitational potential energy, when we state a point to have a certain electrical potential, it must be another point used as a reference point, considering only the difference in electric potential that can be calculated. Usually, ground or electrical conductors connected to the ground are chosen as reference points, where the electric potential of the conductor or the electric potential in the ground is set to zero. So if a point has an electric potential of 12 Volts, the electric potential difference between that point and the ground is 12 Volts. At a 6 Volt battery, the electric potential difference between the positive terminal and the negative terminal is 6 Volts. Because the unit of the electric potential difference is Volt, the electric potential difference between two points is usually referred to as voltage. If the charge q passes through the electric potential difference Vab, the potential energy changes by ΔEP. For example, the charge of 2 Coulomb passes through the electric potential difference of 12 Volts, the electrical potential energy changes by (2 C)(12 V) = 24 Joules. Likewise, if the 4 Coulomb charge passes through an electric potential difference of 24 Volts, the electric potential energy changes by (4 C) (24 V) = 96 Joules. So the change in electric potential energy (ΔEP) is proportional to the charge (q) and voltage (Vab). The higher the electrical charge and voltage, the higher the change in the electric potential energy. Potential energy is related to the ability to do work so that if the changes in the electric potential energy are significant, then the ability to do work is also significant. The equation of the electric potential difference above is still general. To get a more detailed electric potential equation, review the electric potential difference in the homogeneous electric field and the electric potential difference produced by a single charge. Vab = the electric potential difference between two points, E = electric field, and d = distance between two points. Vab = the electric potential difference between two points, k = Coulomb constant, Q = single charge which produces the electric field, r = distance between charge Q and the point at which the electric potential is calculated. The electric field is a vector quantity while the electric potential is a scalar quantity. Vector quantity involves the direction so that it is more challenging to calculate compared to calculating the scalar quantities. To facilitate the calculation of the electric field, using an equation which states the relationship between the electric field and the electric potential. E = electric field, Vab = the electric potential difference between two points such as points a and b, d = distance between two points. The potential difference unit is the Volt, and the unit of distance is the meter so that the electric field can be stated in units of Volt per meter (V/m). This equation can be used to determine the electric (homogeneous) field known as the potential difference between two points and the distance between the two points. Based on the equation, the electric field is proportional to the electric potential and inversely proportional to distance. This means that the higher the electrical potential, the higher the electric field and the higher the distance, the smaller the electric field.